Despite a wealth of changes in the photography market over the last few years, it still seems that Canon manages to provide an option for pretty much every kind of photographer. Whether you're just taking your baby steps or shooting assignments for commercial clients, or (more likely) you're somewhere in between, there's a very good chance that an option with Canon's EOS, PowerShot or IXUS branding would fit your requirements as much as your budget. The company is perhaps best known for its EOS DSLRs, but it maintains a collection of powerful compact cameras and has also now notched up many mirrorless offerings that rival their DSLR cousins for performance. It's also spent the last few years bolstering its Cinema EOS line with video-centric options fit for broadcast-quality filming, and has just recently broken the full-frame mirrorless seal with its EOS R camera. 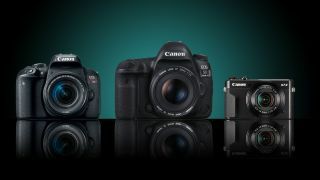 By providing so many options across all levels, it's easy to see both a logical first camera or an upgrade if you're an existing Canon user, but which are the best options from its expansive sea of offerings? We've plucked out ten current cameras that in some way stand out from everything currently on offer. Still very much the pro-favourite all-rounder in the EOS line, the 4K-shooting EOS 5D Mark IV is used by photographers and filmmakers alike, and goes up against the likes of the Nikon D850 and a handful of flagship mirrorless competitors. Being two years old means that it might appear a little behind in a number of areas on the spec sheet, but the EOS line has always prioritised wide appeal and reliability over class-beating specs. To that end, we get a 30.4MP full-frame sensor with a Dual Pixel CMOS AF system for smooth focusing during live view and video, together with 7fps burst shooting, great high-ISO performance and a sturdy body that’s the result of many tweaks and refinements from previous EOS 5D generation cameras. 4K video is subject to a crop factor, however, and the use of the Motion JPEG makes for fairly hefty video files, but this is not a deal-breaker – particularly as the Full HD options are more than sufficient for most people. The EOS Rebel T7i, also known as the EOS 800D, arrived at the same time as the EOS 77D, with the two cameras sharing many of the same specs. The EOS 77D certainly has its advantages, but the current price difference between the two still makes the EOS Rebel T7i the much better buy if you're in the market for your first DSLR. It has, for example, the same 24.2MP APS-C sensor, DIGIC 7 processing engine and Dual Pixel CMOS AF system as its elder sibling, and also matches it with its LCD screen and viewfinder. We loved how well the touchscreen controls have been implemented and found live view AF to be nice and snappy – not something you can say about all DSLRs. Sure, the EOS 77D has an extra command dial and top-plate LCD screen, but if you’re not bothered by these extras you can put the money you save towards a further lens. As we found in our review, Canon’s first full-frame mirrorless camera is something of a hit-and-miss affair, but for some Canon users looking to step up to something more capable, it may just be ideal. While the model retains much of what makes the EOS DSLR line special, Canon has thrown in a superb electronic viewfinder with a 3.69-million dot resolution. We’re also very encouraged by the new lenses that have been released so far, although Canon has continued support for its exhaustive EF lens system through three separate adapters. It would have been nice to see an AF lever, sensor-based image stabilisation and an additional card slot to make the model truly competitive, but the camera is at least blessed with excellent autofocus, good handling and very sound image quality. If you’re a user of older EOS 5D or double-digit models and you’re looking to step up the the very latest in Canon’s full-frame tech, you should find adopting the EOS R to be a pain-free affair. Targeted at the outdoors photographer intending to capture sports, wildlife or anything in between, the weather-resistant EOS 7D Mark II is Canon's current flagship APS-C model. With a 20.2MP sensor and two DIGIC 6 processing engines in the driving seat, the camera is able to shoot at 10fps, with 65 all-cross-type AF points ensuring the camera remains sensitive to all kinds of details in the scene. By today’s standards, the 670-frame battery life and a video recording option that maxes out at Full HD are nothing to get excited about. The lack of a touchscreen and built-in Wi-Fi may also be an issue for you, although a USB 3.0 port provides a speedy way to offload images direct from the camera. Many entry-level DSLRs suffer from being somewhat bland on the spec sheet and uninspiring in use, but the EOS Rebel SL2 (known as the EOS 200D outside the US) adds a handful of useful technologies to make it far more capable and enjoyable to shoot with. So, for example, Canon’s excellent Dual Pixel CMOS AF system is present for swift focusing in live view and during video recording, which also means that you can happily use it much like a mirrorless camera without the same kind of focus lagging common to other DSLR live-view systems. You also get a flip out touchscreen that lets you shoot from all kinds of awkward positions, and even a mic port for better audio recording during videos. True, it’s not quite as compact as the previous EOS 100D, although this arguably makes it a better option if you plan on using longer or heavier lenses, such as nice wide-aperture prime lens for portraits or a dedicated macro optic. Challenging the notion that you need a interchangeable-lens camera to achieve great images, the PowerShot G7 X Mark II boasts a 1in sensor, Raw shooting with post-capture adjustment, and full manual control over exposure and focus to get your images looking their best in camera. The tilting screen aids unorthodox compositions, while the built-in ND filter makes the use of a separate one necessary for long exposures or when capturing videos in bright light. Fast burst shooting, great high-ISO results and grip that allows you to get a much better hold that we normally get on such cameras only further its appeal, as does the convenience of USB charging. If you want to capture 4K video, however, or if you prefer shooting with your eye up to the viewfinder, you may want to look elsewhere as the camera offers neither of these. Still, considering its price and everything else it manages to offer its target market, it still manages to stand up against its peers. Canon’s original resolution monster, the EOS 5DS R is definitely not a camera for everyone, but it's one of the most obvious choices for anyone needing masses of detail to be recorded in their images – and who's prepared to pay for the privilege. A brother to its EOS 5DS launch partner (pictured above, right), with the same 50.6MP full-frame sensor at its heart, it’s the ‘R’ variant that has the advantage of its optical low-pass filter effects being cancelled out as this helps to grab as much detail as possible. You need very good glass and impeccable technique to realise this, though, and while images are supremely detailed, it’s perhaps more at home on a tripod out in the field or in the studio than it is as a general everyday camera, particularly as its ISO range tops out at a maximum ISO 6400. For something more versatile the EOS 5D Mark IV is perhaps the way to go, but for still-life work, portraiture or anything else in the studio that doesn’t involve particularly repetitive details, the EOS 5DS R is a mighty fine choice. Canon’s most recent arrival to its EOS M series might be the first model in the range to be furnished with 4K video capabilities, but that’s not necessarily its strength. What it does well is offer DSLR-like handling, strong autofocus and sound image quality in a very compact form, with the additional advantages of a high-resolution electronic viewfinder, a flip-out touchscreen and 10fps burst shooting making it versatile enough for everything from sports and street photography to use in low-light conditions. There are a handful of shortcomings, such as mediocre battery life and a limited lens range (at least for now), and it’s perhaps better suited to younger users who value touchscreen operation over more tactile physical controls. As an alternative to a Canon’s more traditional DSLRs, however, it remains a component option with a lot going for it – let’s just hope we see more lenses released soon. While not the newest camera, this remains the only compact to combine an APS-C sensor with a built-in zoom lens, which makes it a viable alternative to a DSLR or mirrorless camera for those fussed about image quality buss less so about interchangeable lenses. A healthy spec sheet sees 9fps burst shooting, weather-resistance and Canon’s excellent Dual Pixel CMOS AF system all on board, with an effective dual-sensing image stabilisation system and a clear electronic viewfinder assisting with image capture. The touchscreen is also a highlight, showing excellent response when poked or swiped. On the downside, the 24-72mm (equivalent) zoom range may prove limiting, and we would have liked to see slightly stronger wide-aperture results at the 72mm end. The 200-shot battery life is also something of a let down, but if the camera ticks all your other boxes then an additional battery is the simple solution to this. The EOS-1D series is the darling of sports photographers worldwide, and this most recent iteration bring many layers of new technology to broaden its appeal among working professionals. Notably, Canon chose to include 4K video recording at up to 60p, while also adding a touchscreen to ease operation. It also installed its tried-and-tested sensor-based Dual Pixel CMOS AF technology to keep focus swift and accurate whether you’re using live view or shooting videos, together with a fresh 20.2MP full-frame sensor to deliver the best combination of dynamic range and high-ISO performance, keeping the pixel count modest to allow for 14fps burst shooting (which you can boost to 16fps when using live view). Yes, it’s a large, weighty and expensive bit of kit, and the arrival of a slew of high-performing mirrorless bodies may challenge its dominance in the world of sport photography in years to come, but using it makes you realise just why Canon got to this position in the first place.